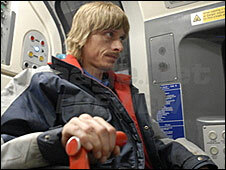 A Tube union plans to protest at next week's premiere of comedy Three and Out, starring Mackenzie Crook. Crook plays a driver who tries to find someone who will commit suicide under his train so he can get compensation. But Aslef general secretary Keith Norman said: "These incidents can mean life-changing traumas for drivers. A spokesman for the British film, which also stars Imelda Staunton, said: "Difficult issues portrayed in the film have been handled sensitively." "Although Three And Out was not designed to generate debate about the serious issues it raises, the makers feel that if it makes people think as well as laugh and cry, they have hopefully made a film that audiences have engaged with and enjoyed." Mr Norman, whose union represents London Underground drivers, said: "I don't want Aslef to look like some sort of kill-joy organisation, because we're not, but there are issues which we shouldn't ignore - and this is one of them. "I want the public to be aware of how distressing it can be for a driver to discover a body under the wheels of his or her train." The union said it had received strong support from the public over its opposition to the film. Its members plan to give leaflets to fans at the premiere, reading: "We hope you enjoy the movie tonight, but please remember that for train drivers like ourselves, deaths on the railway are never funny."